Self Sustainable Growth Rate (SSGR) is the rate of growth, which a company can achieve from its profits without relying on additional sources like debt or equity dilution. SSGR estimation has occupied an important part of my stock analysis as it indicates the strength of the business model of a company. A company with high Self Sustainable Growth Rate can continue to show high growth rates without impairing its capital structure, i.e. without raising high debt. I believe that the growth funded by profits is the best form of growth as it keeps the company insulated from many adverse factors during tough economic environments. Debt has a high cost attached to it. The interest eats into the profitability. Interest and principal needs to be paid as per agreed schedule irrespective of the company generating profits or not. This increases the risk of bankruptcy during tough times. The shareholders of debt-free companies can sleep easy at night irrespective of the company facing economic headwinds or tailwinds. Debt-free companies have the leeway of reducing prices, dividend payouts and even suffer losses for a longer period than debt-laden companies. Therefore, debt free companies have higher probability of coming out successful from economic downturns and provide avenues of long-term growth to investors at lower risk. Self Sustainable Growth Rate (SSGR) is one such parameter that can help an investor determine, which companies would be able to show debt free growth in future. The investor can then study further about these companies and post detailed analysis, she can shortlist companies for investment. The investor, convinced with detailed financial, business, management & valuation analysis and high SSGR, can keep the invested companies in her portfolio with confidence. I thank my friend, Saurabh Dwivedi, a sea-surfer turned banker, for providing his valuable time & inputs where after multiple rounds of discussions & iterations, we could bring the Self Sustainable Growth Rate (SSGR) formula to the implementation stage. A company needs to do these activities year on year for long periods. If the company were able to do it successfully, then it would generate huge amount of wealth for its shareholders. Net Profit Margin (NPM): NPM highlights the ability of the company to generate profits from sales. Dividend Payout Ratio (DPR): DPR indicates the share of profits that is distributed as dividends to shareholders. (1-DPR) reflects the share of profits retained by the company for reinvestment in its own operations. Depreciation (Dep): Depreciation indicates the wear & tear of a company’s assets over time. It is an indicator of reduced efficiency of existing assets to produce sales as these assets become older. If an investor analyses the combined effect the four parameters discussed above, then she would be able to arrive at the expected growth rate of a company by utilizing only the retained profits. This expected growth rate is Self Sustainable Growth Rate (SSGR). All the input ratios like NPM, Depreciation, Dividend Payout, Fixed Asset Turnover keep on changing year after year and huge variation in any one year can significantly alter the SSGR output. The formula assumes that profits reinvested in any year get converted in to fixed assets in the same year and start generating sales from next year. However, in reality any capital expenditure (capex) done by a company would take a few months or years to become operational in form of increased production capacity. The formula does not factor in an important parameter where funds are locked in or released during the year, which is working capital. Out of the three points highlighted above, first two can be mitigated by taking average of last 3-year data of all the ratios i.e. NPM, Depreciation, Dividend Payout and Net Fixed Asset Turnover. Taking average will reduce the impact of any single year abnormal high/low value. Simultaneously, it will also ensure that the impact of reinvested profits of each year get distributed over 3 years, which is a reasonable period for any company to operationalize new capex into enhanced capacity. Important: I have used the 3-year average of all the ratios for the cases discussed in the illustrations below. Regarding the third point of funds being locked in/released from working capital, an investor can find the evidence from comparison of cumulative net profit after tax (cPAT) of last 10 years with the cash flow from operations (cCFO) over the same period. Based on her case specific findings, the investor can adjust her interpretation of SSGR outcome to reflect the reality. We would discuss some of such cases in the interpretation section below. A) If Self Sustainable Growth Rate (SSGR) is more than the sales growth of the company. It indicates that the company has the ability to generate cash in excess of the requirement to sustain its current growth rate. Such companies usually keep on accumulating cash, can afford to give high dividends without impacting prospects of future growth or can increase their growth rate in future without straining their capital structure. We can see examples of a few companies that have their Self Sustainable Growth Rate (SSGR) more than their current growth rates. The Self Sustainable Growth Rate (SSGR) of FDC Limited is about 30-40%. However, the company has been growing at about 8-10% over last 10 years. Comparison of past sales growth with SSGR would indicate that its entire growth could be funded by its profits. An investor can notice that FDC Limited has very low & almost nil debt on its books. We can see that the Self Sustainable Growth Rate (SSGR) of Container Corporation of India Limited is about 22-25%. However, the company has been growing at about 8-11% over last 10 years. Comparison of past sales growth with SSGR would indicate that it could fund its entire growth by its profits. No wonder that Container Corporation of India Limited is a debt free company. The Self Sustainable Growth Rate (SSGR) of Hindustan Unilever Limited is about 40% whereas its sales growth has been 12% over last 10 years. The result is that Hindustan Unilever Limited is a debt free company because it could fund its growth by its profits without relying on additional debt. Thus we can see that the companies with SSGR higher than past sales growth are either debt free or have reduced their debt significantly over past. These companies are good investment candidates as they can keep growing without need of debt and can face tough economic situations better. Such a situation will indicate that the company’s business model does not have the inherent strength to sustain the growth rate it is trying to achieve. The company would continuously need to supplement its profits by bringing in additional cash from equity infusion or debt, to fund its growth aspirations. Most of such companies rely primarily on debt to meet the requirement of additional cash and thereby see high levels of debt on their balance sheets. Let us see examples of a few companies that are growing at a rate higher than their self-sustainable grother rate (SSGR). We can see from the above data that the Self Sustainable Growth Rate (SSGR) of Amtek India Limited is very low, almost 0-1%. This is primarily because of very low fixed asset turnover of 0.6-0.7. Low SSGR indicates that almost entire sales growth of 25-30% in the past has been debt funded. There is little surprise left in the observation that the debt of Amtek India Limited has increased from INR 156 cr. to INR 5,186 cr. over last 10 years. We can see that the Self Sustainable Growth Rate (SSGR) of Ahmednagar Forgings Limited is about 5-6%. However, the company has been growing at about 30-35% over last 10 years. Comparison of past sales growth with SSGR would indicate that the excess sales growth of 25-30% in the past has been funded by debt. Therefore, the debt of Ahmednagar Forgings Limited has increased from INR 62 cr. to INR 2,092 cr. over last 10 years. We can see that the Self Sustainable Growth Rate (SSGR) of Glenmark Pharmaceuticals Limited is about 15-18%. However, the company has been growing at about 25-30% over last 10 years. It indicates that the excess sales growth of 8-10% in the past has been funded by debt. Therefore, the debt of Glenmark Pharmaceuticals Limited has increased from INR 437 cr. to INR 3,267 cr. over last 10 years. We can see that the Self Sustainable Growth Rate (SSGR) of Polyplex Corporation Limited is lower than its sales growth over last 10 years. Therefore, the debt of Polyplex Corporation Limited has increased from INR 100 cr. to INR 1,821 cr. over last 10 years. It has reported losses in FY2014 when it had to pay interest of about INR 200 cr. to lenders for its debt of INR 1,821 cr. (assuming interest rate of about 11%). We can see that for all these companies, which are trying to grow at a pace faster than their inherent Self Sustainable Growth Rate (SSGR), their debt levels are spiraling in an attempt to provide funds needed to produce the excess growth. The debt-funded growth exposes the company and its shareholders to high risk of reduced profitability and bankruptcy during tough economic situations. C) Companies that have SSGR less than current growth rate, but still manage to reduce debt over the years. Ideally, companies with Self Sustainable Growth Rate (SSGR) less than current growth rate are expected to see high debt levels as seen in the above discussion. It is with the assumption that such companies do not generate sufficient funds from their profits to meet the requirements of growth. However, an investor would come across companies where despite low Self Sustainable Growth Rate (SSGR), the companies have reduced their debt levels. In most of these companies, the investor would find that the companies have improved their operating efficiency over the years or have sold their assets to generate cash to repay debt. Improved operating efficiency would release funds stuck in working capital either in the form of inventory or receivables. Increasing inventory turnover or decreasing receivables days lead to funds stuck in working capital being released. It would be evident from cCFO of last 10 years being higher than cPAT over the same period. Funds raised from sales of the assets would appear as positive cash from CFI (cash flow from investing). We can see the example of Fiem Industries Limited, which has SSGR lower than current growth rate. Nevertheless, it has been able to reduce its debt by improving its operating efficiency. We can see that the Self Sustainable Growth Rate (SSGR) of Fiem Industries Limited is about 1-2%. However, the company has been growing at about 25% over last 10 years. Comparison of past sales growth with SSGR would indicate that the excess sales growth should have been funded by debt. It has been true in the past as we can see that the debt levels of Fiem Industries Limited has increased from INR 23 cr. in FY2005 to INR 139 cr. in FY2012. However, the improved inventory turnover in recent years from 12.0 to 15.8 has released the capital stuck in working capital. This has led to the generation of excess cash by way of cCFO over last 2 years of INR 148 cr. (71+77) than cPAT of INR 64 cr. (27+37) over same period. The cash released from working capital could be used by the company to reduce its debt over last 2 years from INR 139 cr. to INR 87 cr. An investor should be cautious while investing in such companies, as their inherent business model cannot sustain high growth rates they are trying to achieve. Debt reduction is mainly due to improving efficiency. Debt levels are expected to rise, when these companies reach optimal level of operating efficiency and are not able to reduce working capital further or do not have further non-core assets to sell. In such companies, the investor needs to see whether the entire profits are available for fixed asset creation or are being stuck in working capital. A simple test to find this out is by comparing the cumulative net profit after tax (cPAT) of last 10 years with the cash flow from operations (cCFO) over the same period. If cCFO, which factors in changes in the working capital, were significantly less than cPAT, then it would indicate that the company would not be able to maintain its current growth rate without raising additional funds. Otherwise, the company would need to raise additional cash by either equity or debt to fund its increased working capital needs along with growth. We can see that the companies, which have high Self Sustainable Growth Rate (SSGR), are able to grow in a debt-free manner and provide good wealth creation opportunities for shareholders. Increase net fixed asset turnover (NFAT) by using better technology & processes so that it can produce more sales from same amount of fixed assets. I believe that an investor should invest in companies, which have nil or very low debt on their books. Such companies are easy to find by filtering all the stocks on debt to equity parameter. However, the ideal investments are the stocks, which can remain debt-free when they grow in future. The investor can find such stocks by analyzing the Self Sustainable Growth Rate (SSGR) during detailed analysis. This brings us to the end of this article in which we learned about assessing the inherent growth capabilities of companies. We noticed that companies trying to grow at a higher rate than the Self Sustainable Growth Rate (SSGR) end up having a lot of debt on their balance sheet. Such companies expose the shareholders to high risk. On the other hand, if companies having Self Sustainable Growth Rate (SSGR) higher than current growth rate, then they can keep on growing without raising debt and provide good long-term investment opportunities for investors. After putting these values in the SSGR formula a reader would get the values of SSGR calculated by me. Hi Dr Vijay, Is there any difference in SGR (sustainable growth rate) calculated by ROE x (1 – dividend-payout ratio) as described in Investopedia and Self-Sustainable Growth Rate (SSGR)? Both give similar assessment of companies operating efficiency and profit generation. You would be able to appreciate the differences and similarities, if you try to analyse the components of ROE and Self-Sustainable Growth Rate (SSGR). You may use the DuPont analysis for ROE and the components of SSGR detailed in the article above. I suggest that you do the analysis and share your observations. I would be happy to provide my inputs on your observations. I have done the analysis of both Self-Sustainable Growth Rate (SSGR) and sustainable growth rate (SGR) for some of the companies and I have found there is differences in the both the parameters in different combinations as we use different parameters to calculate it. I personally feel Self-Sustainable Growth Rate (SSGR) give better reflection as it includes the NPM, Net asset, depreciation and dividend payout ratio (DPR) for calculations. I would like to hear your observations and opinions in this matter. Finance is a very interesting field which allows any investor be as creative as she wants and tweak existing ratios or create all together new ratios and use them for stock analysis. An investor may use any ratio as per her convenience and conviction. SGR is derived from ROE and therefore its interpretation is more or less same as ROE. An investor may use DuPont’s analysis to delve deeper into understanding of ROE or similarly SGR. I like Self-Sustainable Growth Rate (SSGR) from SGR as I believe that SSGR tells about the debt free growth potential whereas SGR will tell about the growth while keeping the current capital structure (i.e. debt and equity mix). ROE and SGR can be easily increased by increasing leverage. Regarding many categories of comparative SSGR and SGR values, it’s great to know that you did the comparative analysis. Such analytical exercises provide good learning opportunities for investors. I have really enjoyed reading your blog. You have great clarity in your thoughts and presentation. Many have only the former and hence are not great teachers. Can you please clarify if it makes sense to compute SSGR for HFCs and other financial institutions with some tweaks or it does not? If we can tweak it, can you elaborate further? I tried replacing NFAT with Net Long Term Loans and using a Depreciation rate of zero. What are your thoughts? SSGR is primarily useful for manufacturing companies and would not be very useful for sectors like financial institutions like Banks/NBFCs/HFCs. Further, to complicate the matters, the information shared in the annual report of financial institutions is not sufficient to assess their financial position, therefore, I do not attempt to tweak/adjust the SSGR to suit FIs. I would suggest you to proceed with you adjustments to SSGR formula with Net Long Term Loans and other such parameters and see the outputs to determine whether it is able to differentiate between good & poor performers in HFCs and other FIs. Hi doctor, Nice thought process. I think that Self-Sustainable Growth Rate (SSGR) is a modified version of return on capital employed (ROCE), a very helpful one though. I generally prefer to invest in companies with high ROCE even if such a company is available at a bit high valuation. As far as there is a high difference between ROCE and cost of capital (CoC), one shouldn’t worry too much about the debt. But I think with your SSGR model, one can easily analyse companies with moderate ROCE. Thank you for sharing this. Hi, thanks for your inputs! It depends on how you calculate ROCE. There are investors who use only PAT in numerator while calculating ROCE whereas, there are others who use EBIT in numerator. Self-Sustainable Growth Rate (SSGR) on the other hand, does not add back interest in numerator at any stage. You have mentioned about Ambika Cotton Mills limited and its great shareholder friendly management. But after using your screener calculator it is showing SSGR in the range of 2-3% which is well below its sales growth rate of 15% but it has FCF/CFO of an excess of 50% which is a good sign. In your article of Margin of safety in the business, you have mentioned the importance of both SSGR and FCF. Here, Ambika Cotton Mills Limited is having very low SSGR which does not provide any margin of safety. Accordingly, it is not good for the investment I guess. What should an investor do when he encounters with a company having good management, good ratios, Positive FCF but poor SSGR? Please explain such scenario where FCF is good but SSGR is lower than that of sales growth as I have encountered with Ambika Cotton Mills Limited. Sir, I really appreciate you for the great insight in stocks through SSGR article. Is SSGR is so influential to take any decision of buying of stock? Hi, thanks for your feedback & appreciation! I am happy that you found the article useful! Stock buying decision should be based on multiple factors. Self-Sustainable Growth Rate (SSGR) can be one of these factors. It has improved its inventory turnover as well as receivables days and has managed to reduce its debt and fund its growth by improving its operating efficiency. In the case of choosing between SSGR and FCF, I would advise that choosing FCF would provide better objective results. It means if a company comes under Part C of SSGR where the company is improving its operating efficiency and has FCF in positive then it can be treated as good for investment? Doesn’t it reduces the use of SSGR when FCF is positive in a company as is the case of Ambika Cotton Mills Ltd? The article highlights that SSGR does not factor in working capital changes, which are also a source of cash/avenue of consumption of cash for companies. The changes related to working capital are captured in FCF calculations. I tried to understand the formula. Kindly correct me if I am wrong. The formula roughly translates into Fixed Assets – Depreciation + (Net Profits – Dividend Paid)/ Fixed Assets. You are right that the essence of the concept of SSGR and its formula is to compare the decline in fixed assets due to depreciation and then replenishment of fixed assets by retained earnings (PAT – dividend). If the retained earnings are not able to replenish the impact of the reduction in fixed assets due to depreciation, then year on year net fixed assets will decline and the company would show negative growth i.e. negative SSGR. What if the company decides to grow less than SSGR? Let me thank you first for enamoring me with lots of confidence to analyze companies. After gone through your explanation for SSGR, I have the following query. As per my interpretation, based on your above explanation, to achieve positive SSGR, or to have SSGR > sales, NFA should grow year on year and it should be funded through RE and not by debt. If my above understanding is right, I agree with the above explanation. However, I observe, there are another 3 options to have SSGR > sales other than NFA to be increased year on year. If I have invested huge money in plant and machinery for the first year itself, why should I use my RE to build further capacity? If my profit increases year on year, my RE too is going to be increased and obviously it’s liability and my liability kept on increasing. This increasing liabilty can be offset/compensated by another 3 ways other than increasing NFA. With increasing RE, I can offset by repaying debt on the liability side itself. Or, equivalent amount of increasing RE can be adjusted on ASSETS side, by increasing CA (Current assets) instead of NFA. That increasing CA can be either increasing inventory or increased “CASH POSITION”. In addition to increasing NFA, to my understanding, as above, there are 3 more options available viz repaying debt, increasing inventory and increasing CASH. If my understanding is right, then why do you harp only on increased NFA only? If my understanding is wrong, where am I making mistake please??? Thank you so much DR, for provided me such a clarity to my knowledge. SSGR indicates the ability/maximum growth rate with which a company can grow if it invests entire retained earnings into its fixed assets. In reality, a company may or may not actually invest entire retained earnings into fixed assets. This is a management decision, which the company will take depending upon the market opportunity that it may predict going ahead. The management may decide to keep entire retained earnings as cash in the bank account. An investor needs to understand the difference between the ability and the actual decision of the management. A person may be able to lift 200kg of weight as per his/her physical power but may not decide to lift any weight at all. However, it helps to know that if the need arises, then the person can lift 200 kg weight. SSGR is the ability to lift weight and not the actual weight that the person decides to lift. Dear Sir, I have tried calculating the Self-Sustainable Growth Rate (SSGR) of one company, but I am unable to get the correct value. For the time being, I have not taken the average of three years. I have few independent queries which I am not able to understand. What is share capital? Is it the (number of shares*face value) OR (number of shares*issue price)? If the sales of a company is greater than market cap of a company, is it a good sign? Sorry for too many questions (may be basic). You may calculate it using one year figures or 3 years average as per your preference (the number of SSGR would be different as per your assumptions). There is no hard & fast rule to adhere to. I have elaborated on my step as addendum in the article. I would suggest you to follow the steps and go ahead with SSGR results as per your preference and assumptions. It would be difficult for me to vet the calculations of readers individually. Issued & paid up share capital is number of shares*face value whereas number of shares*issue price is equal to issued & paid up share capital + amount in the securities premium account. You may google for reading more about face value and share capital. You would find many good articles & resources provide information for your queries. I prefer Investopedia.com. You are doing a fantastic job and I can’t praise you enough for your brilliant service to the investor community. Maintaining a blog all alone is not all an easy task and I know the toil it takes. I have few questions, hope u consider them democratic and not a sign of rebellious or haughty! (I might be completely naive). All in academic context! Is this not similar to Return on Capital? Can you let us know which meritorious aspects of SSGR (equity apart) would I be missing if I am simply using ROC/ROIC Capital instead of SSGR? Especially the way SSGR includes Depreciation as a key factor which is almost nonexistent (compared to other balance sheet figures) in financial companies. In addition growing companies pay minimal dividend and using SSGR with a dividend in formula to measure growth is not self-serving. Graham’s margin of safety concept, especially reluctance to accept anything over 11 PE levels does look quite out of sync with the modern times especially in easy money scenarios globally. Does it require a revisit to adapt the margin of safety as per bull and bear period rather than sticking with margin of safety and missing a whole set of baggers? I am happy that you have analyzed SSGR in detail and provided me as well as other readers with your inputs. There are many parameters, which are used by investors for measuring the attractiveness of businesses. ROE, ROC, ROCE, ROIC, ROA. All of them are different variants of measuring the ratio of profits a company generates utilizing its assets. These formulas use multiple variants of assets like total assets in ROA, only equity funded assets i.e. book value in ROE and other such variants. Similarly there are multiple variants of profitability, which are used in such calculations: some use net profit after tax (PAT), some use profit before tax (PBT), some use earnings before interest but after tax EBI which means EBIT*(1-T). There are followers of each of the above discussed parameter and then there are investor who do not like them. However, finance as a field is very versatile as it gives full freedom for investors to follow her own choice of parameters and also to make new parameters. Therefore, I would not go into the debate that whether someone should use SSGR and discard all other parameters or whether SSGR serves the same purpose for investors which other parameters like ROC, ROCE, ROIC do. SSGR tells us what is the growth rate, a company can sustain with current profitability, dividend policy and operating efficiency and lets an investor gauge whether the growth of the company is intrinsically funded or externally funded. If I have to relate SSGR to any other conventional parameter, then I would probably place it much closer to free cash flow generation. Companies with high SSGR are majorly free cash generation (post capex) business and vice versa. Also Read: Why Return on Equity (ROE) is not meaningful for Stock Market Investors! SSGR is mainly suited for manufacturing companies and does not have much relevance to financial services companies as one of the cornerstone of SSGR, which is net fixed asset turnover ratio, does not have much relevance for financial services companies. I prefer net profit margins post exceptional/one time/non-operating items, as most of the times these items are also derived from some impact related to operations only: like non-operating income can be interest/dividend on investments done from past profits, profit on sale of assets is also similarly derived from assets purchased out of funds earned in past, forex losses are part of operating environment etc. Similar logic goes for using funds post dividend declaration. I stress on analysing SSGR while assuming the companies maintaining their current policies. High current dividend payout indicates that the company has a cushion to raise funds internally and increase growth rate. Companies which pay minimal dividend do not have this option. In effect they do not have this cushion. I do not believe in changing the criteria of margin of safety as per market scenario. It is like shifting the goal post as per ones need. On the contrary, such habit is discouraged as it amounts to letting markets take charge of an investor’s investing philosophy. P/E ratio is one parameter of margin of safety. Over the years, I have come across certain other parameters as well, which I consider that are akin to margin of safety. SSGR is one of them. SSGR which is much higher than current growth rate means that the company has the cushion of tolerating low profitability in future while maintaining current sales growth rate. Therefore, an investor may use different parameters as margin of safety as per her conviction. However, I am not in favour of changing the parameters as per market cycles. I believe that such changing approaches might lead to the investor getting stuck in overpriced stocks at the peak of the cycle, which is not a desired situation to be in. Thanks for being generous in sharing your knowledge. My question is a basic one. Could you help me understand why you have taken Net fixed asset instead of gross? Also I was going through the illustration of FDC and Fiem, unable to tally the NFA number published in screener. NFA = Gross block less accumulated depreciation? Is my understanding right? Else could you explain how you have arrived at NFA? You are right that Net Fixed Assets/Net Block = Gross Block – Accumulated Depreciation. Net block has been used in SSGR calculation as I believe that net block is the better representative of value of fixed assets currently in use as it factors in wear & tear (by deducting depreciation) as well as maintenance capex done to reinstate wear & tear (addition of maintenance capex year on year). Using only gross block has the potential of inflating the value of assets under use. Screener website underwent maintenance update last year after which it has changed classification of some of the balance sheet items for past years, especially previous to FY2012. The article on SSGR was written in June 2015 before the changes in the screener website took place. Therefore, you are noticing difference in the data. I would like understand one thing from you relating to the “SSGR” the topic, which you discussed with us on the “Peaceful Investing” workshop held in Mumbai. Firstly, I must thank and congratulate you for coming up with the concept of self sustainable growth rate (SSGR) and sharing it with us. As I have started using this in my analysis and I find it to be quite useful. I just want to understand from you in the above formula what if we replace net profit margin (NPM) with cash flow from operation (CFO) margin to find our SSGR for our target companies. The reason why I am asking you this is that CFO adds up all the non-cash items back to NPAT. Moreover, the money spent on working capital is also accounted for in CFO. Lastly, all the non-recurring expense or gains are also adjusted for in CFO. Therefore, why do we not use CFO margin instead of NPM for our calculation. This way I feel companies, which have efficient working capital strategy will be highlighted and vice versa for non-efficient working capital management by the firms. I am curious to understand this from you. I am not sure what pros and cons it would result in by making this adjustment. We prefer PAT as year on year CFO varies a lot and may not be the best parameter of profitability of the business for any particular year. We prefer to interpret CFO on a longer time horizon. Therefore, in our analysis, we check PAT and CFO separately by comparing them over 10 years. We encourage investors to keep improving their formulas and check if it works for them. In case, you find that using CFO provides good results, then you may use the same. Dr Vijay, thank you the details on SSGR. I read your article and readers’ questions, your responses. I have a question that couldn’t find answers to. What is the impact of cash that company holding for years on SSGR? I think you are counting it in re-investable funds in above explanation. However if my understanding is correct it is not treated as fixed asset so not considered in NFAT. Would amount of cash distort the SSGR? How to interpret it in those cases. Thanks for writing to me with your inputs. I am happy that you have brought the point of cash holdings to the fore. SSGR is an estimate of the growth rate, which the company can achieve without leveraging itself. Whether the company actually achieves or not, is dependent upon whether the company uses all the possible resources/levers in its business model or not. If an investor analyses the derivation of SSGR calculation formula, then she would notice that SSGR uses the post dividend funds accruals (average of last 3 years) to extrapolate the potential sales growth, these funds can generate. If a company is maintaining high cash balances consistently year on year, then SSGR calculation will assume this as its current business model/strategy and use the non-operating income (interest on cash/FD) as its business revenue in the net profits, while calculating the potential of future growth rate. Effectively, SSGR will reflect the future growth based on the funds utilization shown by the company over last 3 years (if the investor uses average of last 3 years for different parameters of SSGR). If the company keeps cash on its books, and FD return is less than the return this cash could earn, if invested in fixed assets, then the SSGR of the company would be lower to that extent. Does declining SSGR means declining Moat? I have tried to analyze Coal India with the method of SSGR you described. Its SSGR is decreasing from 61% to 14%, does this mean the moat for coal India does not exist anymore. Also, it is being stated that company has improved its operational efficiency which is not reflecting in the results. Any thoughts for this? Following is my calculations. 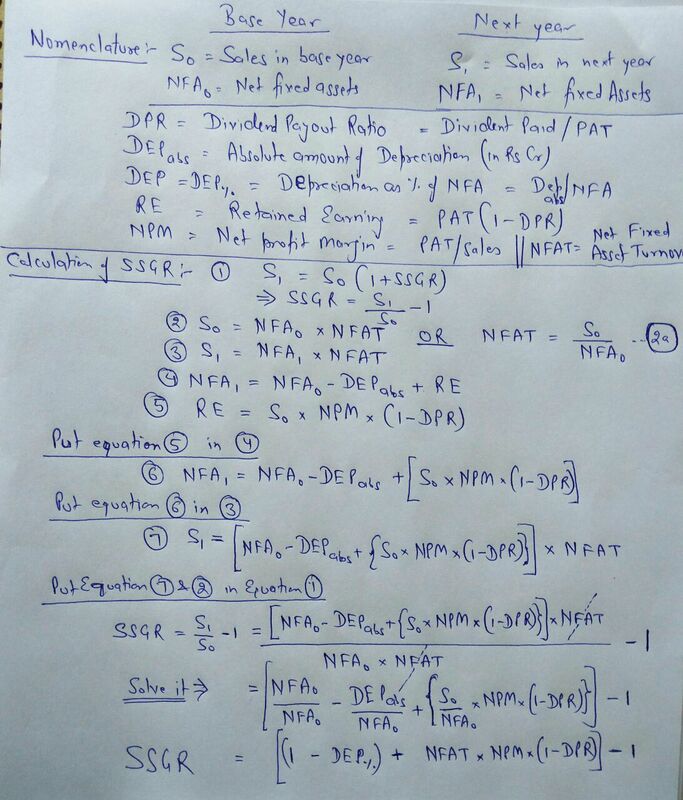 SSGR, as mentioned in its dedicated article, factors in the dividend payout ratio in its formula. As the dividend payout increases, the amount of money for reinvestment in the business decreases and as a result the SSGR decreases. You would notice that in recent years the govt. has been asking Coal India to pay hefty dividend to meet its fiscal deficit targets. As a result, the money retained by Coal India is going down, which has led to decrease in SSGR. I would like to know whether you use the sustainable growth rate as an investment criterion. If yes, then which parameters you use to find out the sustainable growth rates for companies. If no, then what are the other criteria you use to determine probabilities of consistent healthy growth in future? Your inputs would help the author and the other readers of the website; improve their understanding of stock analysis. You may write your inputs in the comments below or contact me. Currently, I do not own stocks of the companies mentioned above, except Ambika Cotton Mills Ltd, in my portfolio.